It often amazes me that I have easy access to such texts as a first edition of Izaak Walton’s The Compleat Angler (1653). In my mind, holding a book like this is a genuine privilege. When exercising this privilege, I sometimes wonder about the history of The Compleat Angler and other angling books. Who held them before I did? Who read them? And how did these texts influence their readers? Title page. The Compleat Angler or the Contemplative Man’s Recreation. 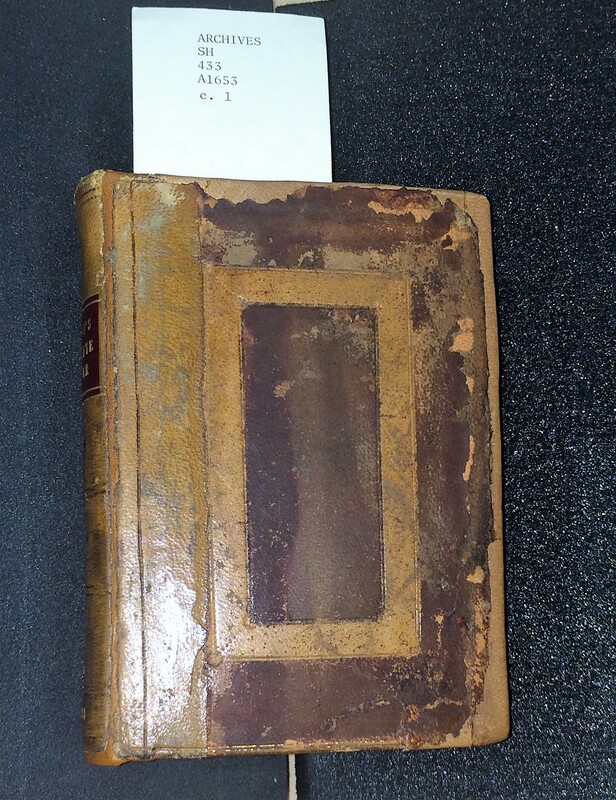 Izaak Walton, 1653, London: Maxey. Manuscripts, Archives, & Special Collections, Washington State University Libraries, Pullman, WA. These special books are housed in Washington State University Libraries’ Manuscripts, Archives, and Special Collections. 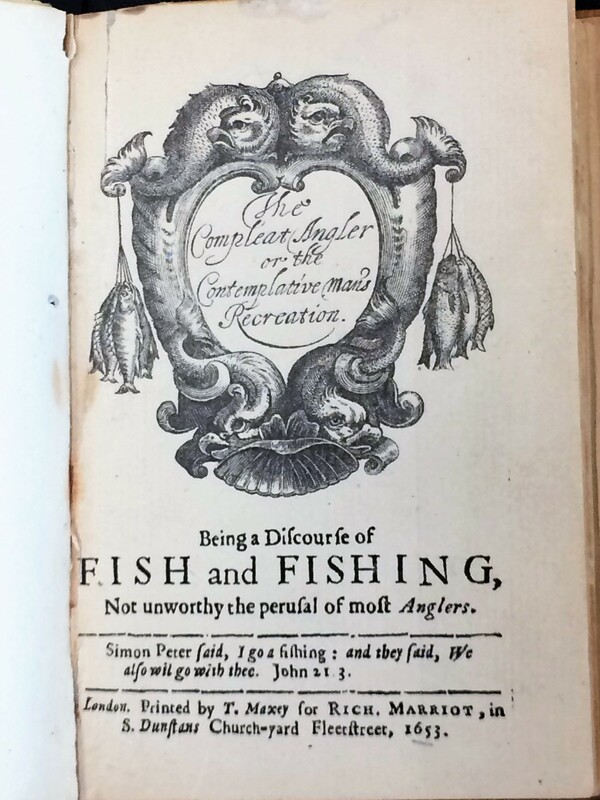 Specifically, The Compleat Angler and other angling texts are part of The Wildlife and Outdoor Recreation Collection. Assoc. Dean Dr. Trevor James Bond and the rest of the MASC librarians and staff do a great job of of caring for and protecting the texts. They also do a great job of balancing these duties with the need to make them accessible to the public. This is no small feat. Cover. The Compleat Angler or the Contemplative Man’s Recreation. Izaak Walton, 1653, London: Maxey. Manuscripts, Archives, & Special Collections, Washington State University Libraries, Pullman, WA. As it happens, WSU was the victim of the most prolific book thief in US history, Stephen Blumberg. Blumberg lived in Iowa but traveled throughout North America targeting various collections of rare and fine books, especially at universities. He used stealth, disguise, and incredible ingenuity to steal at least 23,000 books and manuscripts. He stole a huge number of these from WSU. After their theft was discovered, WSU Police Officer Steve Huntsberry played an active role in searching for the thief. Ultimately, Blumberg was betrayed by a friend to the FBI. At the time, in 1990, the collection of books and manuscripts discovered in Blumberg’s home was valued at approximately twenty million dollars. Below, you can see a short video of Huntsberry describing the case as well as some footage of Blumberg’s illicit collection. Blumberg was eventually sentenced to spend four years in prison and to pay a large fine. In the meantime, WSU’s main library was expanded to include the “Holland Addition.” MASC is now located in this new area, which happens to be a genuinely beautiful setting. Here, the rare books and manuscripts are protected not only by the librarians’ watchful eyes, but also by state-of-the-art security designed to deal with both human and environmental threats. Fly fishers and other practitioners of field sports usually think of “public access” as having to do with the land. But it also relates to the cultural history of our activities and to historical understandings of why outdoor recreation is important. At WSU, you can access this information. If you find yourself in the area, I urge you to do so. And if you live elsewhere, you should see what you can find in your local libraries. You might be surprised. For more information on Blumberg, look for Steve Huntsberry’s “The Legacy Thief: The Hunt for Stephen Blumberg,” Art Documentation: Journal of the Art Libraries Society of North America 10, no. 4 (Winter 1991): 181-183. I also recommend Nicholas Basbanes’ A Gentle Madness: Bibliophiles, Bibliomanes, and the Eternal Passion for Books (Holt, 1999), which includes a chapter on Blumberg. This entry was posted on September 6, 2017 at 8:11 PM and is filed under Environmental Literature, Fly Fishing Literature, The Arts. You can follow any responses to this entry through the RSS 2.0 feed. You can leave a response, or trackback from your own site.